Hermes Arceau L’Heure De La Lune watch with Aventurine dial and mother-of-pearl moon phases, as shown at SIHH 2019. 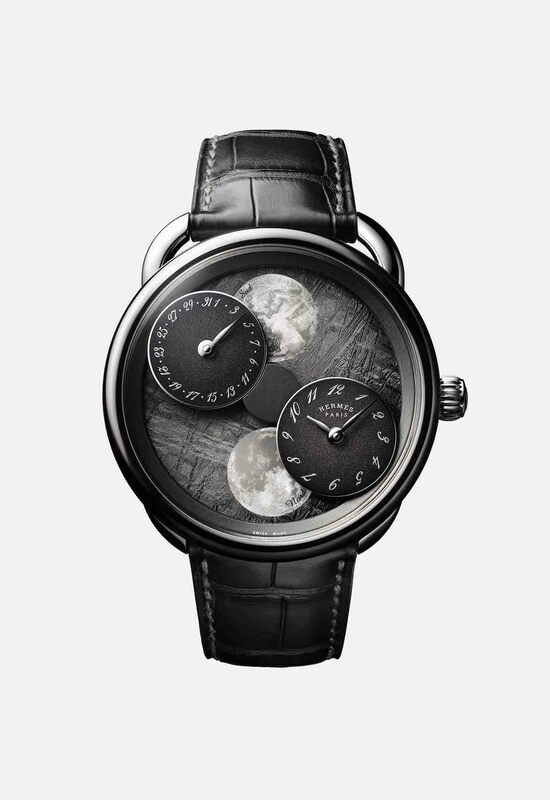 At SIHH this year, Hermes unveils the all-new complicated Arceau L’Heure De La Lune watch — a revolutionary new timepiece that was years in the making. The watch features a specially made module created by Jean-François Mojon, Founder, Co-Owner and Managing Director of Chronode SA. The module is exclusive to Hermes and enables the watch to have rotating hour/minutes and date subdials while the engraved mother-of-pearl moon disks remain in position on the dial. In other words, wherein most moon phase watches the moonphase disk rotates, in this watch the moon disks remain stationary on the dial and the smaller sundials rotate on the larger dial. As the smaller fails rotate, they cut off portions of the moon to indicate the phases. he watch is offered with either a meteorite or aventurine dial. The exclusive module has a patent pending. It measures 4.2mm in thickness and has 117 complements. It joins the Hermes H1837 movement for a total of 193 parts. Making the 18-karat gold watch so dramatic is the fact that these two moonphase displays are huge, they are not apertures, but rather, entire moon indications. The Arceau case was originally designed by Henri d’Origny in 1978, and features asymmetrical lugs. Each of the two versions of the watch is being issued in a limited edition of 100 pieces. The Aventurine dial features white lacquer counters, while the meteorite dial has gradiated gray lacquer subdials. SIHH 2019? 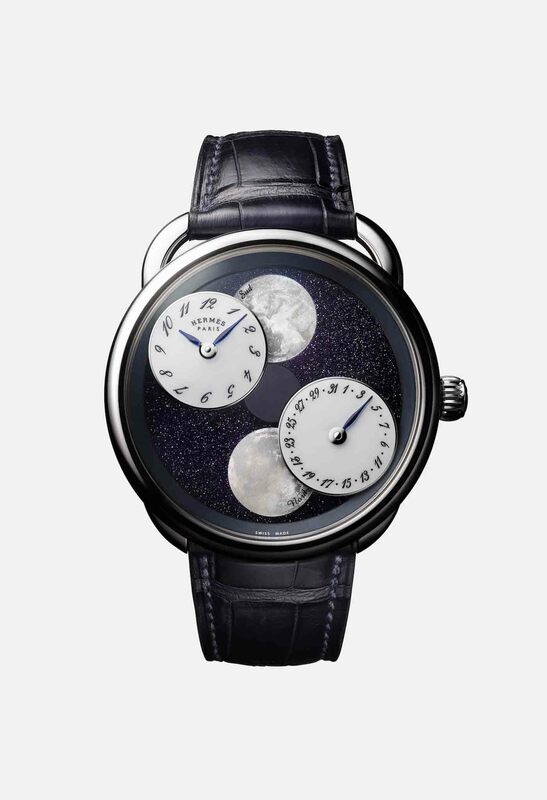 Hermes Arceau L’Heure De La Lune watch with meteorite dial.